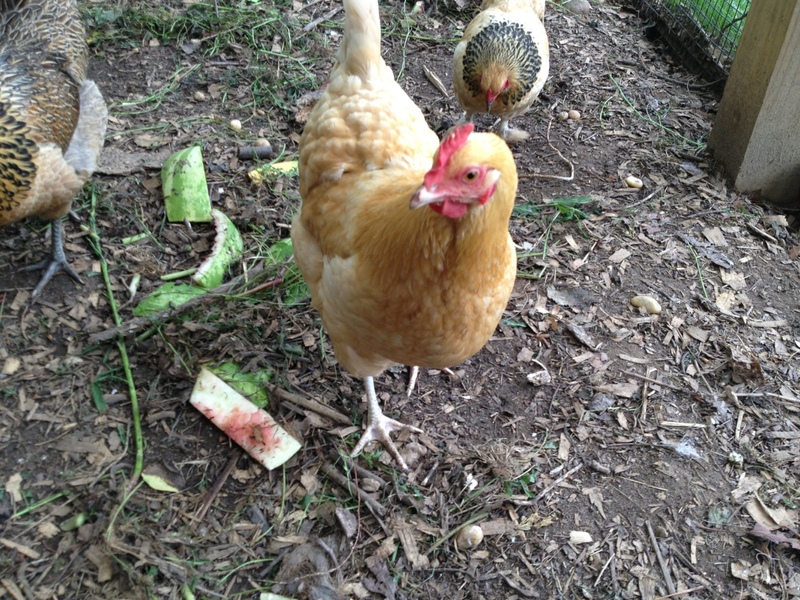 Orpington Update: I Think She’s Ok! A few days ago it looked like a wild ax murderer went through our coop. Splashes of blood littered the floor. Our Buff Orpington was dripping blood from her mouth and roosting in an odd position. Everything being closed on Memorial Day weekend, I trawled the Internet for answers and the results scared the $#%! out of me. Was it the deadly infectious laryngotracheitis which would necessitate the culling of my entire flock? But there was no gasping, swelling, or lesions. Had they been poisoned by plotting neighbors? I couldn’t believe it. Did she get into a fight? Although the blood was bright red and fresh, I couldn’t detect any physical damage. The next day the blood had dried into a black ring around her beak. There was no fresh bleeding. She even laid an egg, but continued to roost in an odd position in the nesting box. She came out periodically to eat and drink, leaving her broody compatriot inside to sit on eggs. Or empty nests. This morning you would never know anything happened to her. She’s up scratching in the run with the ret of flock, minus broody Silkie, who stubbornly refuses to get off the nest insisting that she CAN be the first to incubate unfertilized eggs. The conclusion? The miraculous healing and lack of any symptoms from the rest of the flock lead me to suspect a physical injury, possibly from our aggressive top hen that has bullying the other ladies. I miss our Speckled Sussex, who was taken by a hawk a few months ago, because during her reign at the top she was always decent to her flockmates.